Israel's Record Shop on Fulton Street is spotlighted in short film "Lazarus," which debuts at the NYC Film Festival in May. 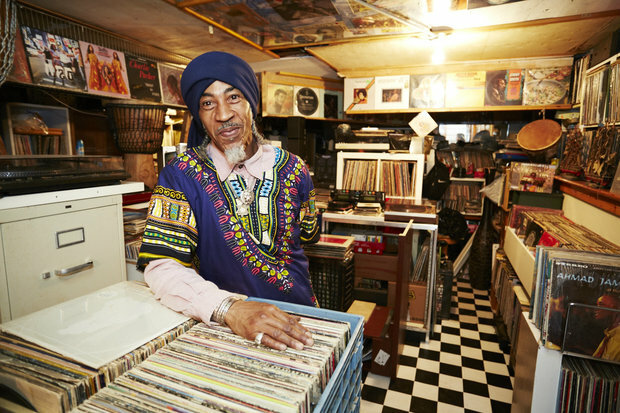 BEDFORD-STUYVESANT — An underground record store on Fulton Street is hitting the big screen. “Lazarus,” an independent film inspired by Israel's Record Shop in the basement of 1118 Fulton St., will debut at the New York City International Film Festival next week. The 15-minute short follows a young man down the Franklin Avenue station into basement record store, where his life is changed after a chance interaction with the owner. Bed-Stuy locals make cameos in the film, which was shot in the area over the span of two days last year. Cortesi wrote the script for “Lazarus” after visiting the business and getting to know shop owner Israel Ben Yahuda. “The store is sort of a vault and archive that you just want to soak up — it’s just too precious,” she said. The director tapped Long Island actor Isaiah Mueller for the lead, along with poet and actor Craig "muMs" Grant and Marsha Stephanie Blake, the latest addition to the "Orange is the New Black" cast. "There's something authentic about the love Kate has for this place, in the same way Israel is authentic in his record shop," said Blake, who's lived in the neighborhood for 10 years. "You'll see the love for her neighborhood and the people in it." “Lazarus” premieres at the New York City International Film Festival on May 1 and the Art of Brooklyn Film Festival on May 16. For tickets and more information, visit Cortesi’s website.